Weather - Summer: March to June, Monsoon: July to October, Winter: November to February. Climate of Assam is influenced by its 'Tropical Monsoon Rainforest Zone’ making it a temperate zone, experiencing heavy rainfall and humidity. By Train – A convenient rail network provides accessibility to the state from all over India. By Road – Being a gateway to the other north eastern states, Assam enjoys strong National Highway network. The incomparable beauty and natural bliss of Assam journeyed a lot during the historical passage of time. Its history goes back to the ancient times. There are many Tantric, Buddhist and Vedic literature sources along with Assamese folklore that unveil the presence of this incredible Indian state on the subcontinent. Its illustrious mention is accredited to the famous epic, Mahabharata. During Aurangzeb’s rule in medieval history, the state was addressed as Asham. And the British influences on this land can be still seen in the form of heritage tea estates that were planted by the colonialists of the region. Geographically tucked within the corners of kingdom of Bhutan and Arunachal Pradesh in the east, Nagaland, Manipur and Mizoram towards the south, Meghalaya towards south-west and Bengal and Bangladesh towards its west, Assam is a strategically located state in the entire north-east India. It is due to its strategic location only that the state is considered the gateway to the ‘seven sister states of North East’. The state’s average elevation ranges between 300-400 m, due to the naturally formed gorges on Khasi, Garo, Karbi Anglong and North Cachar Hills. This state is also known as the land of Red River, due to the presence of Brahmaputra in the region. It is often believed that Brahmaputra is even older than the Himalayas and when it enters Assam, it channelizes its flow through its tributaries and creates flourishing fertile grounds for cultivation in the region. The main farming activities of the landscape are dedicated to rice, bamboo groves, numerous tea gardens and shady acacia trees for protecting the tender tea leaves. The tea estates are the colonial-era bungalows offer relaxing, heritage-style getaways along with an option of golfing on these heritage grounds. 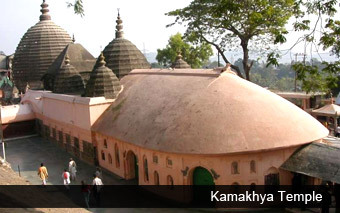 Also, the state is known and frequented for Majuli, the world’s largest river island on the banks of River Brahmaputra. These sandbanks represent the fragile eco system of the river where paddy fields, water meadows and fish traps form the enticing attraction. Besides all these attractions, the state is rich in its customs and way of life that is reflected by its simplistic dance forms such as Bihu, Jhumur Nach, Bhortal Nritya and Bagurumba; regional dress accompaniment called Gamocha, the rectangular cotton cloth with red borders and extensive use of Bamboo shoots in arts, crafts and other cultural components. One of the world’s richest biodiversity zones, Assam’s flora is characterized by the tropical rainforests, riverine grass lands, bamboo orchards and numerous wetland ecosystems. The state is also known for orchids and other valuable plant species and products that are extensively visible in the Assam’s way of life. The special preserved ecosystems of Assam feature as the natural world heritage sites of Kaziranga and Manas Wildlife Sanctuaries. Kaziranga is the home for the rare one horned Indian Rhinoceros, the state animal of Assam and Manas is known for its tigers. Besides these iconic wild species, there are other animals dwelling as the state’s rich fauna including spotted deer or chital, swamp deer or Dolharina, clouded leopard, the hoolock gibbon, pygmy hog, wild buffalo, hispid hare, golden langur, golden cat, giant civet, binturong, hog badger, porcupine, Gangetic dolphins, mongooses, giant squirrels and pythons. The state is also rich in avian as well. 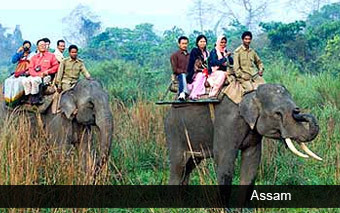 Famous birds like blue throated barbet, white-winged wood duck or deuhnah (Cairina scultulata), ring-tailed fishing eagle, great pied hornbill, Himalayan golden-backed three-toed woodpecker or barhoituka(Dinopium shorii shorii), and the migratory pelican are a part of Assam’s vivid ecosystem. Eat – Famous as the land of Bhut Jholokia, the world’s hottest pepper, Assam is known for many indigenous delicacies elevating the taste buds with exciting flavours. Tourists in Assam should not miss Khar (a fruity mild and finely pH balanced delicacy using a unique banana alkaline), Machor Tenga, Kharoli, Tarkari, Grilled Shrimps or Mach Poora, Bamboo Shoot Fry, Roasted Duck, Fish Fried Rice, etc and other exotic recipes. Buy – Cane and Bamboo Craft, Bell Metal and Brass Crafts, Handlooms, Toy and Mask Painting, Pottery and Terracotta Work, Wood Crafts, Traditional Paintings, Exotic Jewellery and Musical Instruments can be sourced as souvenirs from the peerless state known as Assam. Hotels - Assam is a delightful, hospitable and deeply civilised state where tourist can have numerous hotel options to stay.